Arabella has ground training and is learning how to load in the trailer. BellaMia was born in 2013 on a beautiful spring day on the farm. We can't decide if this sweet heart got her temperament from her mother-Sophia, or father-The King's Good Friday. We will let you be the judge! ​Congratulations to Gary and Laury! "Emma" as she is known around the farm, was born in 2013. 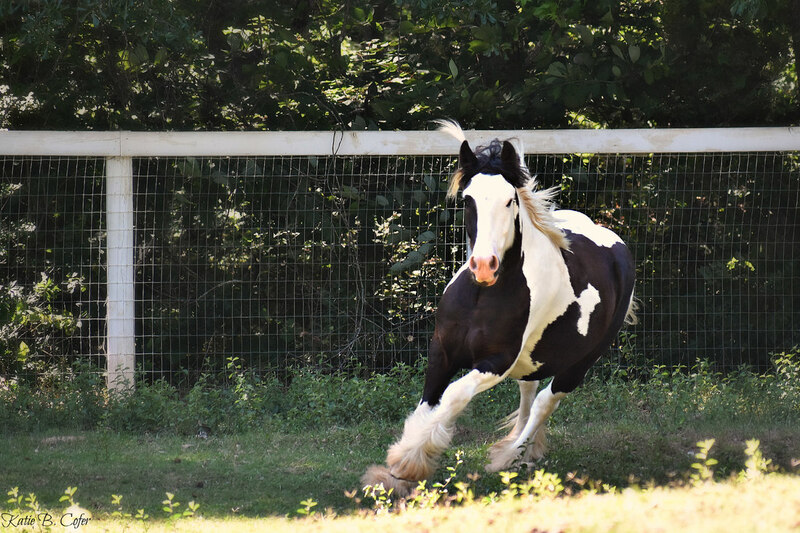 This big girl has the bone and build of a very traditional Gypsy horse. She is By The King's Good Friday and out of Betty-(BFM). Congratulations to Gary and Laury! ​Hachi or lovingly know as Nugget around the farm is a special colt. 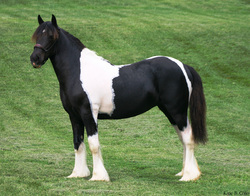 His Dam, Sophia and sire, The King's Good Friday are two wonderful examples of the Gypsy Vanner breed. 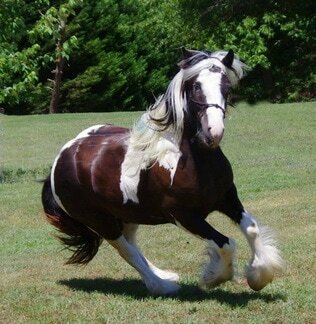 His temperament, bloodlines and color make him a winner! 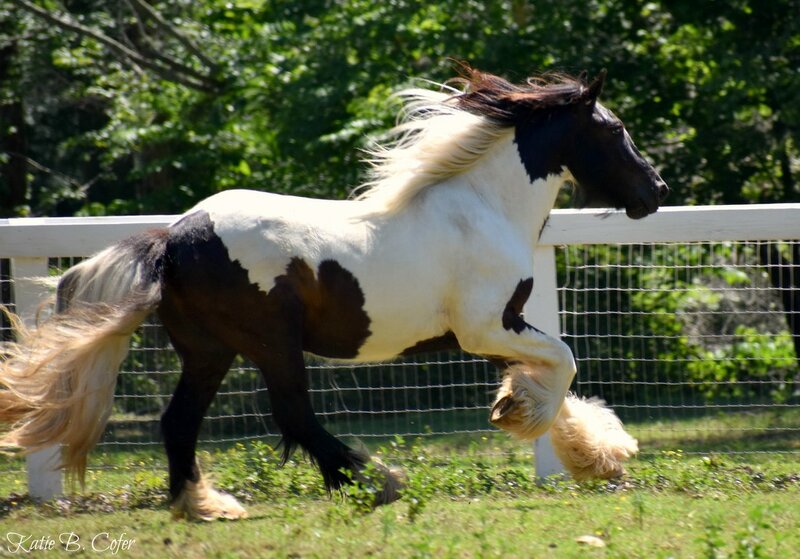 His bloodlines include: The Gypsy King, Ves'tacha, Cushti Bok, Esmeralda, The Old Horse of Wales, The Lottery Horse. It Doesn't get much better than that. ​Our first baby of 2014! Meet Prince Charles, aka Comet! He was born around 9:30 pm on April 9th, 2014. 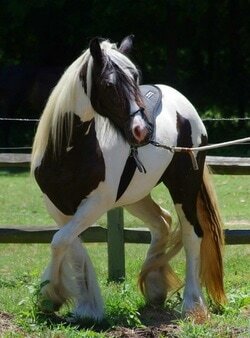 He has beautiful markings and the cutest personality to match! He has also earned the nickname "fancy pants" because of his leg markings. ​Jack Jack, as he is known around the farm is a 2014 colt out of Ves'Tacha and by Mitty. Mitty is Fionn x Kaulo Ratti, and was bred especially for a sweet temperament, which Fionn has and passes on. Kaulo Ratii is by The Gypsy King, is one of the first 16 Gypsy Vanners in the U.S.
Jack Jack has ground training and is learning how to load in the trailer like a true gentleman. We will be posting more pictures soon. This little colt is The King's Good Friday's half brother. 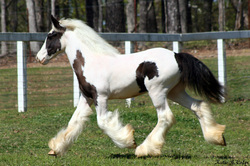 Crystal is an outstanding example of the Gypsy Vanner Breed. She has a wonderful temperament, and is compact with OUTSTANDING movement. She would be suited for any discipline, with her temperament and quality she has a bright future ahead of her. Her sire, the King's Good Friday had a wonderful temperament and has lovely movement. Her dam, Treana is beautiful quiet, and very easy to ride and has been shown. Crystal's lineage goes back to the Old Horse of Wales, Cushti Bok, The Gypsy King and Rexie. Crystal is ready to go, with many years ahead of her! Crystal is a lovely example of the breed, by Gypsy King son The King's Good Friday out of Vintage Vanner's Treana, a Cushti Bok daughter. Crystal has it all - temperament, conformation, hair to spare and a beautiful chiseled head! In addition, Crystal is double-bred by The Gypsy King and she can MOVE! This wonderful filly was born in 2009 and has already been started under saddle and doing wonderful. We know Khloe will be so happy at her new home. This filly has impecable breeding. Lines include: The Black Faced Mare, Bommarito, Roadsweeper UK*, Lottery Horse, and The Gypsy King. She is awesome! On 7/17/07 Treana delivered a smashing colt with color, conformation and blue eyes. 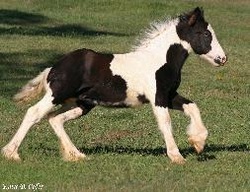 This foal has wonderful lineage with The Gypsy King AND Cushti Bok as grand-sires. DJ's lineage goes back to the Old Horse Of Wales. DJ is now owned by Robin Visceglia of Still Water Farm in N.C. Congratulations on an outstanding stud colt! DJ is now standing at stud at Robin's farm. Please visit our links page for more information. In May of 2006 The Black Faced Mare graced us with Kalista- a beautiful filly, sired by Vintage Vanners Bommarito! This filly has some great blood lines that go very far back. Including, The original Road Sweeper, The Gypsy King, and Cushti Bok to name a few. Kalista is now owned by Vintage Vanners and is excelling in English Pleasure and Dressage!